Staatz, J.M., 1987a, 'Farmers’ Incentives to TakeCollective Action via Cooperatives: A Transaction Cost Approach. In Royer,Jeoffrey S. (Ed). Cooperative Theory: New Approaches. Washington, DC, UnitedStates of America: United States Department of Agriculture. Staatz, J.M., 1987b, 'The structural characteristics offarmer cooperatives and their behavioral consequences. In Royer, J. S. (Ed).Cooperative Theory: New Approaches. Washington, DC, United States of America:United States Department of Agriculture. Citavi orders them alphabetically, I need to cite it according to the place of in text citation, which for me is the other way around. 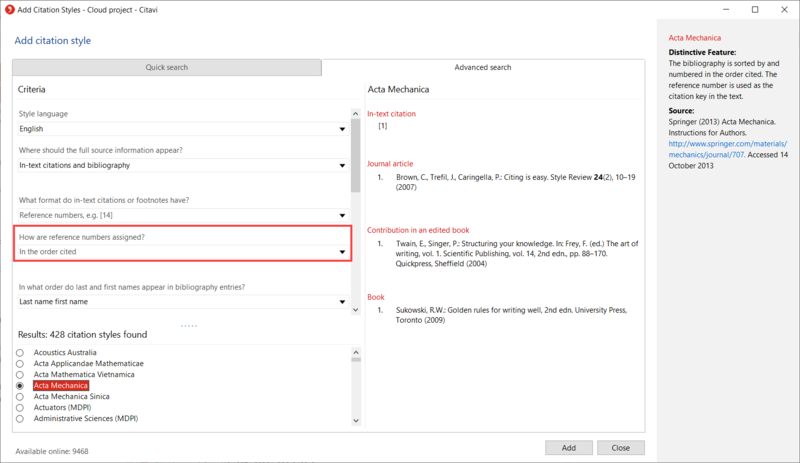 In Citavi on the Citation menu, click Citation style > Browse citation styles. Click Find and add style. Choose the style by selecting various Criteria. As you select more answers the number of styles displayed decreases. Select the new style in Citavi's Word Add-in. Hi Peter, the problem is that I am already working with my own style. Can I do this for a style I created? the problem is that by doing that all the references will appear in the bibliography according to the order cited, and I don't want that. I just need that the two references with the same author and year appear in the in text citation and bibliography in the order I quote them, and not alphabetically according to the title of the publication. I am sorry to bother you with all these questions, believe me I have been trying to solve them on my own for quite some time. The letters in the text (1987a, 1987b) are assigned according to where a source appears in the bibliography. For example, you might have a reference by Staatz from 1987 with the title "Farmers’ Incentives" and one from the same author and same year with the title "The structural characteristics" If you cite "The structural characteristics" before "Farmers’ Incentives " in your text, you will see the reference (Staatz 1987b) before you see (Staatz 1987a). The sorting principles "by citation" and "alphabetically" can't be combined (that is not a problem of Citavi but of the Harvard citation method). Thanks Peter for the clarification.